This chicken cordon bleu recipe started with a mission. My husband was asking for chicken cordon bleu but does not like swiss cheese. so I sought out a recipe without. 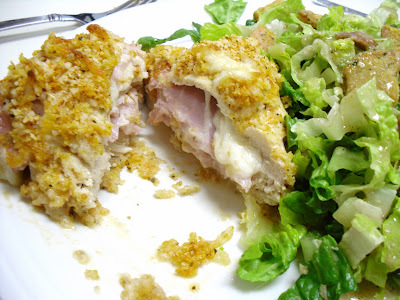 This is a modified version of a chicken cordon bleu recipe from cooking light, so I tried to alter it without adding to many calories to keep the recipe "light". Serve with a salad and a glass of pinot grigio! 2. Place broth and butter in a microwave-safe bowl and heat for 20 seconds. Stir in garlic. 3. Combine panko, grated parmesan, and paprika in a medium shallow bowl. 4. Place each chicken breast half between 2 sheets of plastic wrap, and pound each to 1/4-inch thickness. Season chicken with salt, oregano, and pepper. Top each breast half with 1 slice of ham and 2 tablespoons mozzarella. Roll up each breast half jelly-roll fashion and insert toothpick to hold together. 5. Dip each roll in chicken broth mixture; then coat evenly in panko mixture. 6. Place chicken, seam side down, in a baking dish coated with cooking spray, spaced at least 1/2 inch apart. Pour remaining broth mixture over chicken. 7. Bake at 350° for 28 minutes or until juices run clear and tops are golden.